Boatrocker's Ramjet is well on its way to becoming an Aussie cult classic. The Starward whisky barrel-aged imperial stout has a growing band of slavish devotees and has been named People's Choice Best Beer at three consecutive Good Beer Week Gala Showcases. The barrels that helped create the luscious 10 percent plus beer are back at Starward helping create a Ramjet whisky and we believe they will then return to the brewery to make a Ramjet squared (or whatever name they come up with) in the future. For those that can't wait that long, it's time to meet Ramjet's big brother, Roger. 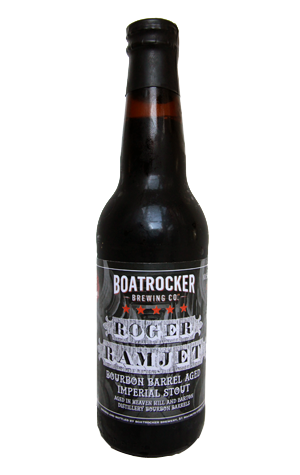 Roger Ramjet is pretty much the same beer but this time aged in Heaven Hill and Barton Distillery bourbon barrels. The beer that's come out the other side shares its sibling's incredibly enticing aroma (well, at least if you're of a sweet-toothed bent); like lashings of creamy chocolate fudge, the sort that a young Crafty Pint would lavish upon tubs of ice cream on rare childhood trips to the States, but with a liqueur twist. Joining the rich chocolate in its thick, gloopy body are vanilla and a touch of roast, while the impact of the bourbon grows as it warms, adding a spiciness to the aroma and flavour and leaving a spirituous perfume behind.